lala was in Beijing in the minus 10 degrees snow of late 2009.
lala: In talking with you and looking at your website, I am really intrigued by how diverse your work is, recently I have been observing this flexibility or adaptability to be something that Australian contemporary artists are quite good at. I know you spend your time between Adelaide and Beijing now, do you think this is something that is a cultural thing or is it something within you? MY: For many architects flexibility is about a structure with multiple uses or something that can be reconfigured. Its about options and change and possibilities. In art, maybe it is a willingness to explore–a trait I enjoy. It is about tackling issues with imagination. Diversity? During the boom years of Asian art, I noticed a rush for artists to find their iconic thing, the thing with which curators could identify them with. This style of working did produce some significant works especially by those artists that were considering the way in which they were working. But, it was also very destructive–especially for young artists. Curators need to share the responsibility here too. Time and again, we see curators arriving in Beijing to ‘touch the China thing’. They produce a show out of complete ignorance after a week touring studios. And, it happens all across Asia. This is a phenomenon that has pushed a lack of diversity in people’s practices. Horses for courses, we say! A different racehorse for a different racetrack. I don’t see my practice as particularly diverse, but I’m probably too close to it to notice. Look at someone like Yayoi Kusama. Her practice involves museum installations, public sculptures, video, painting, photography, mobile phones, clothing, cats, etc. That’s diverse. Well actually, yes my practice does involve a similar variety of things, but I guess there is such an enormous amount of possibilities to imagine. lala: And the Donkey Institute of Contemporary Art – how did this come into existence? MY: To explain a little about DICA, DICA is an artist run space I run with a friend Yam Lau that exists on the back of a donkey and travels around the streets of Beijing. Yam and I were chatting about Beijing’s porous boundaries. Beijing is a city that is especially difficult to define with its change and growth. The city doesn’t just expand outwards. The countryside reaches inwards: farmers bring their produce in; rural style villages exist well within the city’s limits and reforms from the 1970’s left behind green patches inside Beijing–a concept that was being explored in other parts of the world as an antidote to the excesses of modernist urban planning. 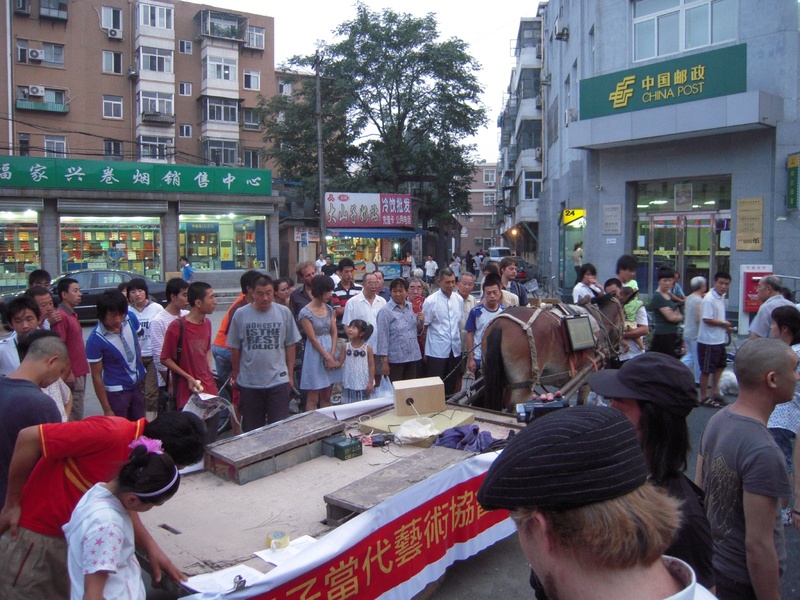 These days a donkey is still a common sight in Beijing, not a foreign object. They aren’t really allowed inside the fourth ring, but we often see them inside the second ring. In fact, donkeys can be dangerous amongst cars getting spooked and charging down the road. In this way, we are always very mindful of the donkey’s safety. Yam and I met in the summer of 2008. It wasn’t until the following summer that DICA had its first outing. Maybe a project like this will be full of false starts, but I should mention that the opening was delayed by a week because our donkey was arrested before the first show. The traffic police impounded her for a week when the owner took the donkey to a part of Beijing it wasn’t supposed to go. We helped the farmer get the donkey out but not in time for the opening. With the help of artists Ma YongFeng and Shen Yi and her SUV, we tracked down another donkey hours before our first outing. Fun memories. lala: The idea of ‘slowness’ and also of meandering encounters with its audience seems important to you in the DICA and also in other works such as Follow (2007/8). Is this some need in you as an artist to shift the paradigm in which an audience views work? Or is it a want to create a more personal interaction? MY: The idea of speed is important in art, as important as scale or colour or form. Would I say that I’m interested in shifting the way audiences view work? Perhaps, not. But, there are many ways to view, interact, engage with art. I’ve personally seen the process of some museums and galleries going through exploring alternative ways for audiences to view art, but in the end they remain at their core about collecting the object. It’s a contradiction. This might sound strange for me to say–because I’m often working with public–but we need to question why we want public involvement. In truth, do we really need the public or are we using the public to speak about unimaginative things? Or to look at it in another way, I’m amazed at how the public is so often used without consideration of what public might be. The appropriation of theories by artists always strikes me in the current art climate. Too often, artists place themselves in the position of being sales people for such and such a theory or idea–a go between from the idea’s originators and the broader public. But, in the end, does this add to life and knowledge? Even Plato, who thought art was the betrayal and distortion of Ideas, knew this. So, what I’d want to say is that I like imagining again what public is, and even more so what the city is. And, Beijing is a very interesting place to think about these things. lala: You have been working in Beijing and mentioned to me that you see this as an amazing opportunity to witness the ‘birth of a nation’, does the extreme difference in culture between Adelaide and Beijing feed you as a person and an artist? MY: I got my start in Adelaide particularly with a project with the Adelaide Festival of Arts. In this way, Adelaide holds very fond memories. Now, I spend my time between Beijing and Australia without having put my roots firmly down anywhere particularly in Australia. Standing across two cultures is something that I enjoy, not quite local and not quite foreign in both. And, in Beijing life is quite rich with all its charms and vices. Birth of a nation, yes. Beijing is at a unique point in history. It is a cliche to say everything here changes very quickly but there are serious repercussions when a city like Shenzhen can be built in 15 years. For instance, it means that an entire city of 5 million are nearly all migrants. We can feel this too in Beijing, whose population has also exploded. It’s also cliche to talk about the scale of China in numbers, but at the moment my favorite China-scale statistic is that the Chinese local and central government spend an estimated 30 billion US dollars on cars every year. But, to answer your question more directly, being across to cultures, countries, naturally places me as an outsider in both but with a familiarity that’s beyond the exotic. I like to point to others who have worked across different cultures: Samuel Beckett, the Irishman that wrote Godot in French or perhaps Alexis de Tocqueville, the French aristocrat who wrote so insightfully about American democracy. lala: And now you are moving to Melbourne for a while – what sort of life and practice do you see for yourself here now? MY: I’m in Melbourne for three months. I’m looking forward to some quiet time in Melbourne and a break from shows. And, there will be some time to work on my amateur cheese making. Michael Yuen is an artist that works between China and Australia.